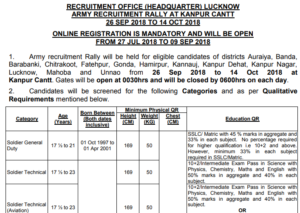 Lucknow Army Bharti 2018: New Relation Recruitment Rally In Uttar Pradesh: Recruitment Office (Headquarter) Lucknow has confirmed the news of Army Recruitment Rally at Kanpur Cantt. Board of Controller of Examinations, Indian Armed Forces has unveiled that from 26th September 2018 to 14th October 2018 Indian Army Recruitment Rally will be organised which is a relation Bharti, sports Bharti but not an OPEN BHARTI. Only candidates from Unnao, Mahoba, Lucknow, Kanpur Nagar, Kanpur Dehat, Kannauj, Hamirpur, Gonda, Fatehpur, Chitrakoot, Barabanki, Banda, Auraiya districts are eligible to apply for this rally. Besides, there are other eligibility criteria and educational qualifications as well. Volunteers will have to fill the application forms that are available or accepted through online mode only from 27th July 2018 to 09th September 2018. Gates of the rally ground will open at 0030 hrs and will close by 0600 hrs every day from 26th September 2018 to 14th October 2018. Total six trades are available for this recruitment i.e. Soldier Tradesman, Soldier Clerk/ Store Keeper Technical, Soldier Nursing Assistant/ Nursing Assistant Veterinary, Soldier Technical and Soldier General Duty. Through four stages of Physical Fitness Test (At Rally Site) i.e. 1.6 KM Run, Beam (Pull Ups), 9 feet ditch and zig-zag balance, candidate’s overall body status will be scrutinized. Those who fail to pass PFT will not be allowed to participate in remaining selection procedure i.e. written test and document verification. Age limit for Sol GD trade is different from other i.e. 17 and half years to 21 i.e. candidates should be born between 01 October 1997 to 01 April 2001 (both dates inclusive). While for remaining five trades, the age limit is from 17 and half years to 23 years old i.e. born between 01 October 1995 to 01 April 2001. Except for soldier clerk, the minimum height of the candidate should be 169 cm and is 162 cm the in case of Sol Clk. Besides, minimum weight in all the six trades should be 50 Kg of individual aspirant. In case of height, weight and chest, small relaxation is given to – Ladakhi, Gorkhas both Nepalese and India, Candidates from Andaman and Nicobar Islands, Lakshadweep group including Minicoy. Apart from that relaxation is also applicable to Outstanding sportsman and candidates of relation Bharti. Stay in touch with ALLINDIAROUNDUP for more information regarding Indian Army Bharti.